Things to think about when supporting communication development. ike anything that grows, children’s speech and language development needs nourishment from the surrounding environment. That nourishment comes from close family members and adults who interact with the child on a daily basis. 1. Two way communication – communication is a two way process. Listening and talking is involved as well as other things such as eye contact and non-verbal communication. One person may talk too much and not let the other talk – this can lead to the other person ‘turning off’. One person tries to encourage lots of input from the other by asking lots of questions – this can lead to a high pressure situation, as well as not being a particularly natural communication interaction.. Many children will not respond well to a bombardment of questions (especially if they’re aware you already know the answers); after awhile they may refuse to engage. Most activities lend themselves to talking together and two way communication; it’s important to comment on what your child is doing but leave lots of pauses and opportunities for them to add in their own commentary. Even if children are pre-verbal, leaving spaces in between what you say will allow them to make sounds, which you can then respond to. In this way you are supporting the vital skills for two way conversation and letting them know early on that their contribution (no matter how small) is important. Try and balance questions with opportunities for your child to begin conversations, express their ideas and feelings. Let them give you instructions and let them be involved in making choices. Rather than always questioning, try starting a sentence and leaving a pause at the end so they can finish it off for you. 2. Attention skills – children need strong attention skills so they are able to listen to the language around them, meaning they are then more able to develop language themselves. Some children find it more difficult to attend for long, and in our busy lives we often try and do 2 or 3 things at once; meaning we may not always be setting the stage for the best communication opportunities. Remove distractions that make it more difficult for your child to stay focused on the interaction (this includes turning off the T.V. and Radio). Look at your child and encourage them to look at you before you talk; praise them for their looking at you, as this shows you they are listening. Use their name before an instruction. 3. 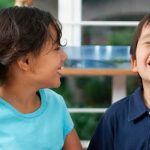 Level of Language – Keeping it simple – it’s really important to match the level of your language to your child’s. Children’s language develops in certain stages and it’s difficult for them to pick up on what we’re saying if we’re using our typical ‘adult’ language forms. We may add too much information into our instructions which is not necessary. We may be using language and sentences that are too complex for our children to understand. With just a small bit of planning, we can reduce background distraction, consider what we’re going to say and how we’re going to say it. We can provide opportunities for our children to practice their own communication skills. Even better, our children love our undivided attention – by making sure we have fun with our children they’ll hopefully want to come back and do more and more of the same. And remember: Play is our brain’s favourite way of learning (Diane Ackerman).